On the Sakura-dori side of Central Government Building No. 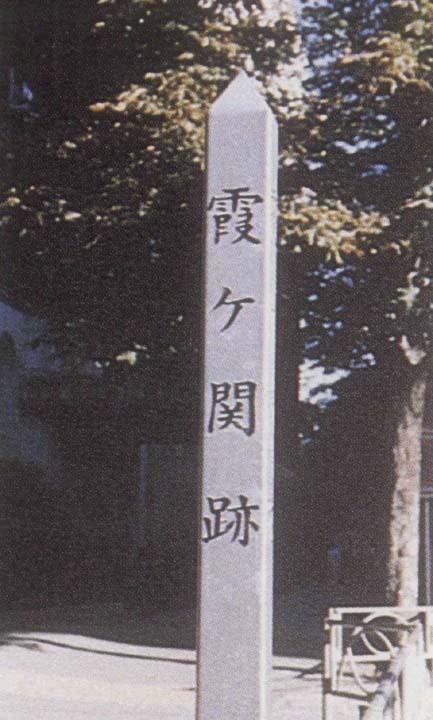 2, there is a monument marking the historical site of Kasumigaseki. Many of the government buildings in the early Meiji period were former samurai residences located in the area of the Imperial Palace. It is said that the first government office to be located in today's Kasumigaseki district was the Ministry of Foreign Affairs, established there in 1870. (Property of the National Diet Library). The Meiji Restoration government located its government buildings around the Imperial Palace for the purpose of centering the government on the Emperor. In 1870, the Ministry of Finance directed that the various government offices be concentrated in the location of the former center of the Imperial Palace. However, this construction never began. 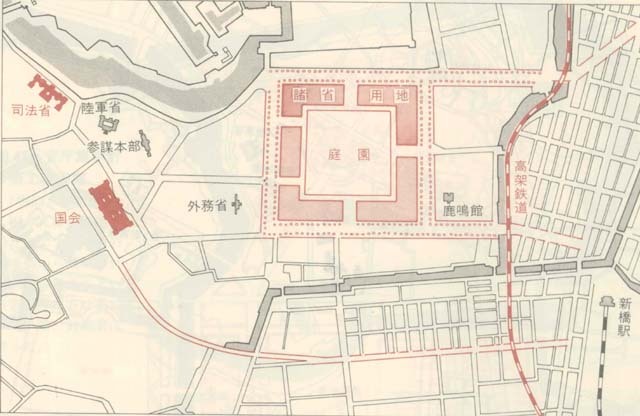 In 1873, the Imperial Palace was destroyed by fire, and the government planned to rebuild the palace and construct government offices in the main circle. However, this plan was not realized due to the poor quality of the ground. One of the greatest challenges facing the Meiji government was the elimination of extraterritorial rights and the establishment of relations with foreign countries on equal terms. In advance of a 1886 conference to revise treaty conditions, Foreign Minister Kaoru Inoue embarked on a Westernization program, and in 1883, the Rokumeikan was constructed, designed by Josiah Condor. In addition, Inoue planned the construction of a number of government buildings, including a today’s National Diet Building, Supreme Court and Ministry of Justice, to present a modern government image to foreign countries. 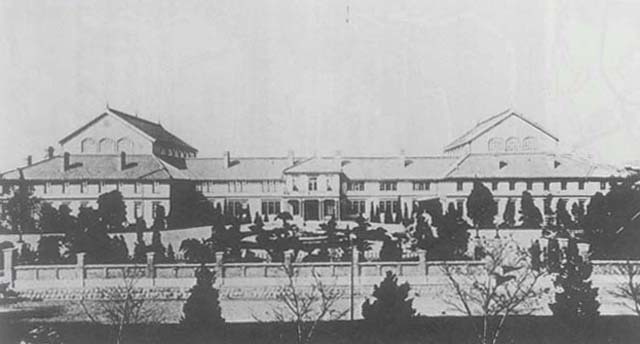 In 1885 Condor was commissioned to prepare two plans to centralize government offices around the Imperial Palace, but these were never implemented. In 1886, the German architect Wilhelm Bockmann arrived in Japan and created a plan for a large central ring of government ministries. 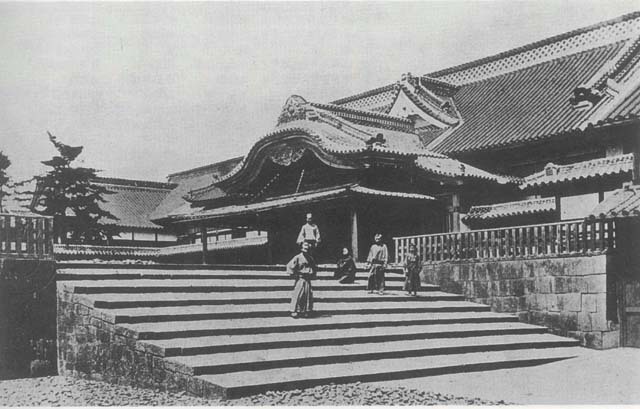 This planned complex extended from the Tsukiji Honganji Temple in the east to the Hie Jinja Shrine in the west, included a central square exhibition space, and was intersected by the Nihon Odori boulevard running east-west. 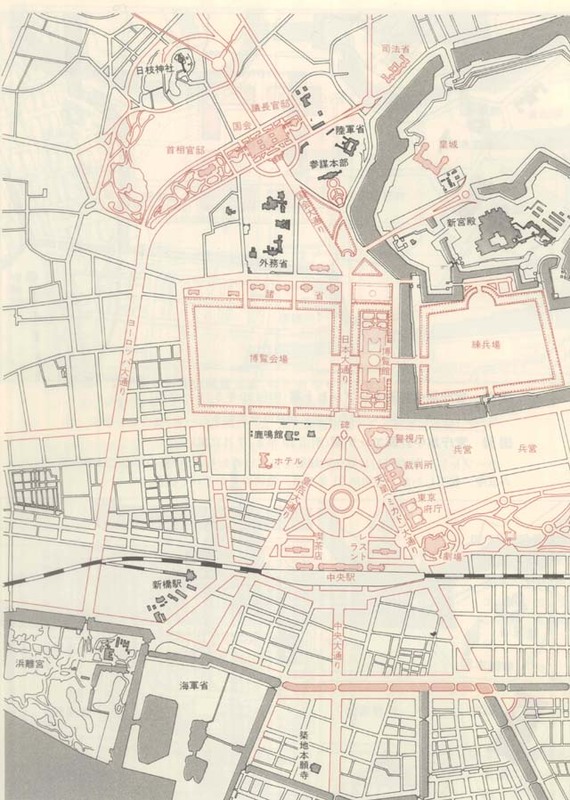 In addition, the planned complex was joined by the Tenno-dori and Kogo-dori boulevards from the east and Parliament Avenue extended to the west. 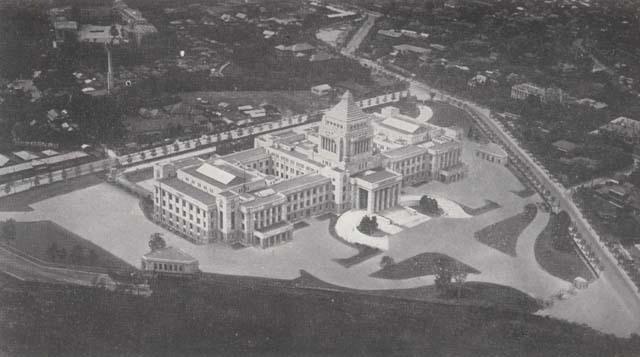 The National Diet Building was planned for the same location it currently occupies, from which Europe Avenue was planned to extend southward. Government buildings were planned to be constructed along these avenues. From "Meiji no Tokyo Keikaku"
The year after Bockmann returned to Germany, two German architects, James Hobrecht and Hermann Ende arrived in Japan within a short time of each other. Hobrecht modified Bockmann's plan significantly, in an effort to reduce the scale of the planned complex. 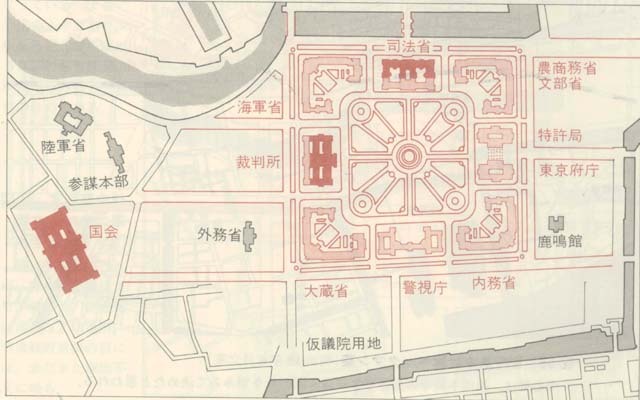 He created a plan in which the government buildings were arranged in a compound around a central courtyard, on the site of the former Hibiya Renpeijo (army parade ground), and surrounded on all sides by tree-lined avenues 60 m wide. The actual layout and design of the buildings was subsequently left to Ende. Ende expressed reservations about the Hobrecht plan, on artistic grounds and due to concerns about the ground at the site, but in the end he agreed to the plan. The Ende plan, in order to pull together the massive 600 m square site, used the same design for the buildings in the four corners which would house, respectively, the Ministry of the Interior, the Ministry of Finance, the Ministry of the Navy, and the Ministry of Agriculture and Commerce in the same building as the Ministry of Education. 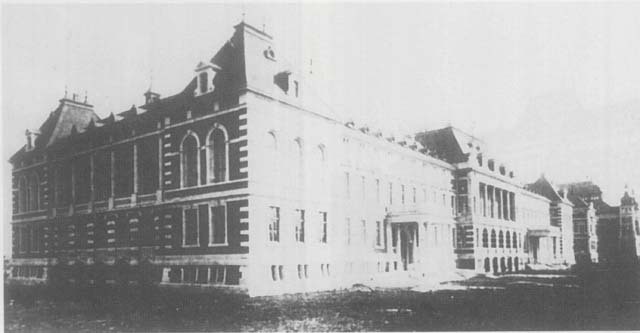 In 1888, Yozo Yamao became the head of the temporary Architecture Bureau, and broke ground for the construction of the Ministry of Justice according to the Hobrecht and Ende plans. However, the conditions of the site were extremely poor, and in the end the plan had to be completely revised. 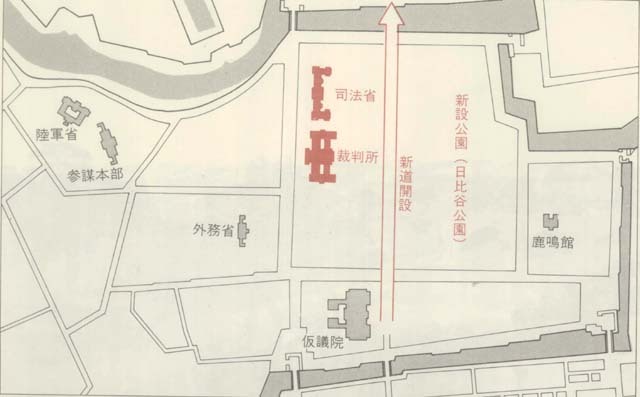 The weak ground that represented half of the sea side of the site, the site of the former Hibiya Renpeijo (army parade ground), would now be a park (today's Hibiya Park), with the Ministry of Justice moving to the side of the Supreme Court on the remaining half of the site, while the remaining government offices would be moved to the site surrounded by the parliament, the Imperial Army General Staff Office, the Ministry of Foreign Affairs, the Supreme Court, and the Ministry of Justice. This plan became the actual plan for centralizing government offices, and formed the basic structure of today's Kasumigaseki district. The Meiji government published an imperial rescript in 1881 calling for the first session of the Imperial Diet to be convened in 1890. In 1887, a site at 1 Nagatacho, Kojimachi-ku (today's 1 Nagatacho, Chiyoda-ku) was decided as the site for the National Diet Building in accordance with the Bockmann and Ende plans, but because the plan would be very costly and difficult to achieve, this plan for the National Diet Building was aborted and it was decided to construct a temporary Diet building at 2 Uchisaiwaicho (the current site of the Ministry of Economy, Trade and Industry, the address of which is now 1 Kasumigaseki). This building was designed by German architect Adolph Stegmueller and Japanese architect Shigenori Yoshii and completed on November 24th 1890. On November 29th of the same year, the first session of parliament was convened in the House of Peers chamber in this temporary Diet building. However, the building burned down on January 20th, 1891, during the first session of the Imperial Diet. In October of the same year, the second temporary Diet building was completed based on a design by Yoshii and the German architect Oscar Tietze. This second building survived the Great Kanto Earthquake (1923), but again burned down in 1925. 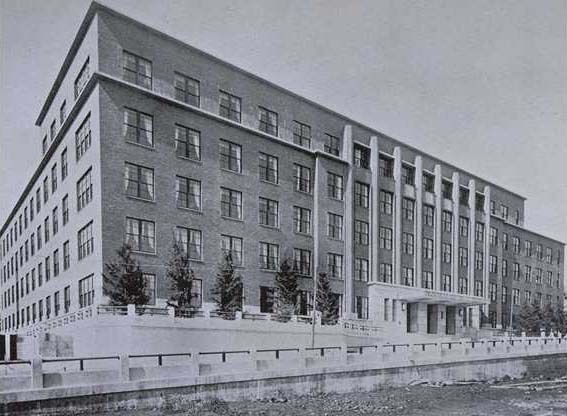 The third temporary Diet building was completed in December of that year and remained in use until the current National Diet Building was completed in November 1936. From "Meiji Taisho Kenchiku Shashin Shuran"
The Ministry of Justice building completed in 1895 is a neo-baroque building designed by H.Ende and W.Bockmann, two German architects invited to Japan in 1886. After the Nobi earthquake (1891) occurred while the building was being constructed, extra efforts were made to improve its seismic resistance. The building was given two main entrances because it was thought to be used as both the offices of the Ministry of Justice and the official residence of the Justice Minister. 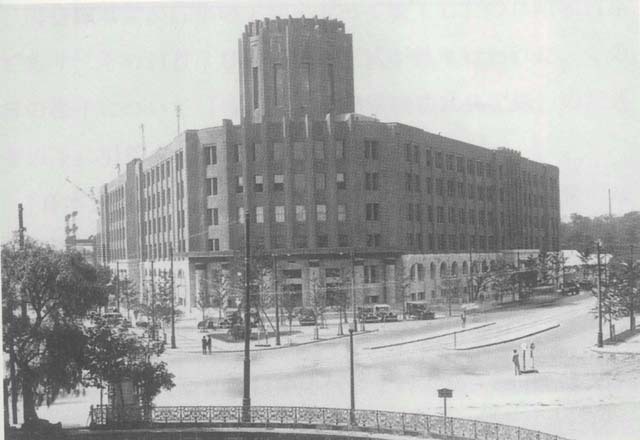 This Ministry of Justice building survived the Great Kanto Earthquake with hardly any damage, but it burned in the firebombing of Tokyo in 1945, leaving only the floors and red-brick walls intact. It was renovated and returned to use in 1950. In 1991 restoration and renovation work began to restore the building to its original condition, including the restoration of the dining room in the Justice Minister's official residence (now the Ministry of Justice Museum) in June 1995. The development of the today’s Kasumigaseki district began when the Ministry of Foreign Affairs moved there in 1870, and the look of the district became something close to what it is today with the completion of the Ministry of Justice and the Daishin-in (the old name of the Supreme Court, later changed to the Saiko-saibansho). Ever since the site for the National Diet Building was decided in 1887, the government received numerous opinions relating to the building's construction from all directions. 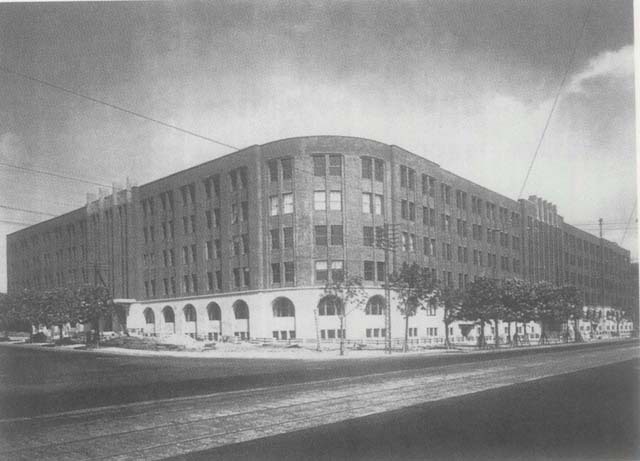 In 1918, the Diet Building Construction Committee decided to request submissions to a public design competition for the new Diet Building. 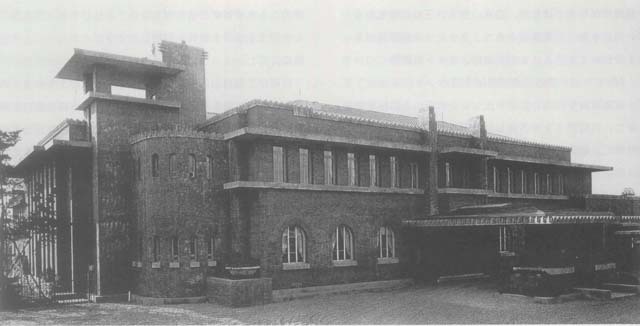 The Temporary Diet Building Construction Bureau soon decided upon a basic design, and in September 1918 announced the rules of the design competition. Of 118 designs submitted in the first stage of the competition, four were selected and announced in October 1919. The Diet Building was completed 55 years after the imperial rescript to convene the Diet in 1881. Based on the winning proposal in the public design competition, the building that was constructed was of an imaginative and modern style that was quite different from traditional buildings. The building was symmetrically arranged around a front central tower with a pyramid-shaped roof in the center and front of the building. In the center of the impressive facade there is a large car porch for members of the imperial household, to the left and right of which are car porches for both houses of the Diet. The construction of the new Diet Building began in 1920 and suffered little damage in the Great Kanto Earthquake of 1923. The building was completed in 1936 after a construction period that lasted seventeen years. In the early years of the Showa period, particularly between 1925 and 1934, there was an unprecedented construction rush in the Kasumigaseki district that coincided with the recovery from the Great Kanto Earthquake. In the post-war era, efforts were made to consolidate and rationalize government facilities, to make it easier for people to use them and to improve the efficiency of the public service as well as to make better and more effective use of the land and to reduce construction costs. Central Government Building No. 1 was planned as the first combined government building to be constructed in Kasumigaseki. This building was completed in 1954 and was the first genuinely fireproof building to be constructed after the war. The completed building was rational and pleasant and the design was simple. The building has since been remodeled and renovated to its present state. The building houses the offices of the Ministry of Agriculture, Forestry and Fisheries of Japan, the Food Agency, the Forest Agency and the Fisheries Agency. Government facilities entered the skyscraper age in the late 1970's and early 1980's. Central Government Building No. 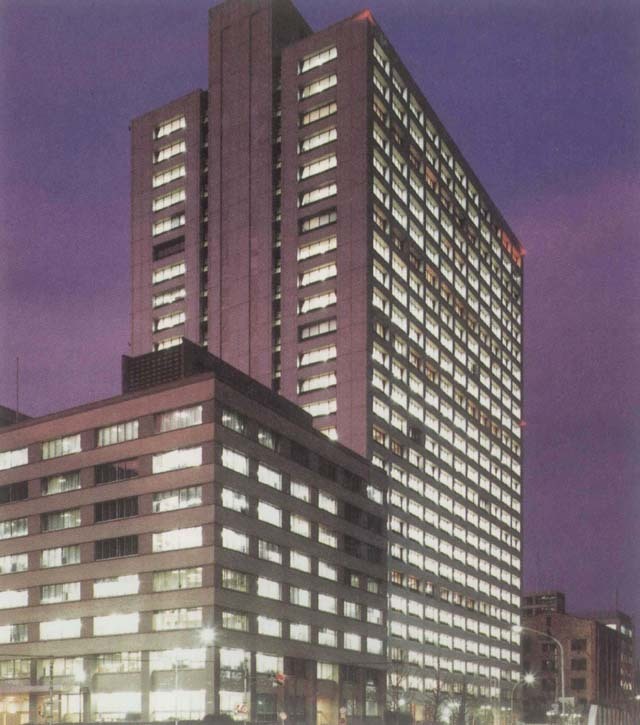 5, completed in 1983, became the home of the Ministry of Health and Welfare, the Environment Agency, the Ministry of Labour (which had previously been outside Kasumigaseki), and the National Land Agency (following a government reorganization, the building now houses the Ministry of Health, Labour and Welfare, part of the Cabinet Office, and the Ministry of the Environment). The completion of this building meant that the goal of centralizing the central government buildings was largely achieved. Central Government Building No. 5 was designed to be an earthquake resistant skyscraper, and to be a model of barrier-free and energy-saving building. 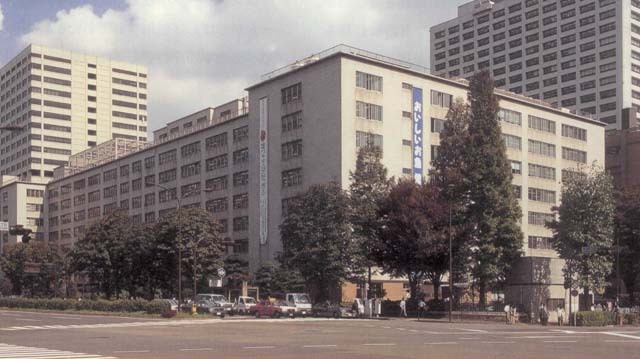 A high level of earthquake resistance was required of the building because the anti-disaster headquarters headed by the Prime Minister in the event of an emergency is included in the National Land Agency, one of the building's original occupants. Today, the functions of the anti-disaster headquarters in the event of an emergency have been moved from the National Land Agency to the Cabinet Office (Disaster Management), which is still located in Central Government Building No. 5. 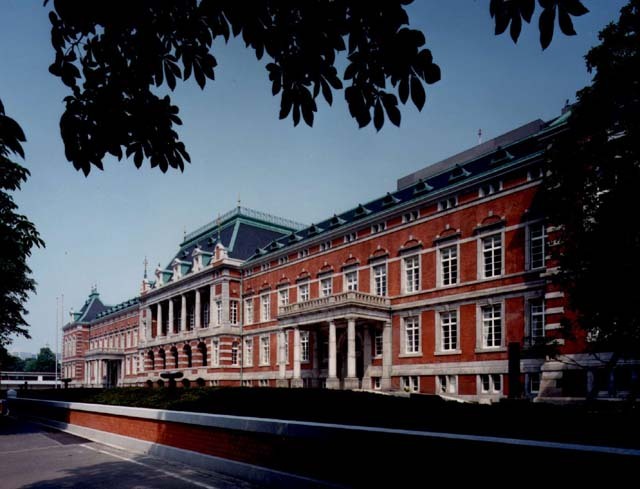 The only building remaining from the Meiji era central government buildings complex is the main building of the Ministry of Justice, the restoration of which to its original condition was completed in 1995. The building's exterior, which has been designated among the Important Cultural Properties of Japan, adds aesthetic charm to the Kasumigaseki government buildings district. 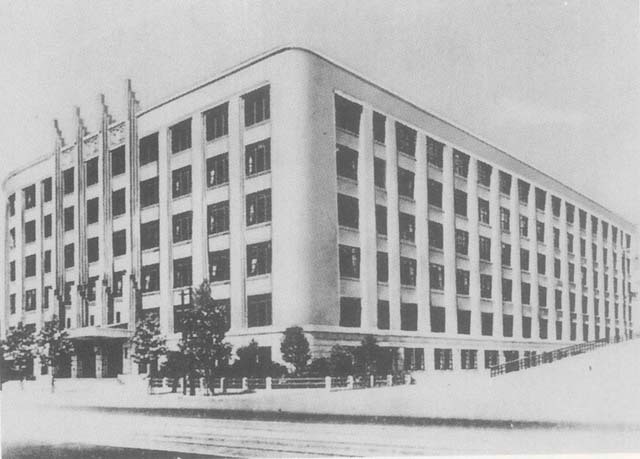 There is currently a project underway to re-house the Ministry of Education, Culture, Sports, Science and Technology and the Board of Audit of Japan, currently in buildings that were constructed in the 1930's in the new Central Government Building No. 7, currently under construction. Building No. 7 is the first government facility to be built using the Private Finance Initiative, which allows the utilization of private funding, management skills, and technology for the construction, maintenance, and operation of public facilities. Building No. 7 will include offices, restaurants and other private facilities, and it is expected to become a hub of activity in the local area. 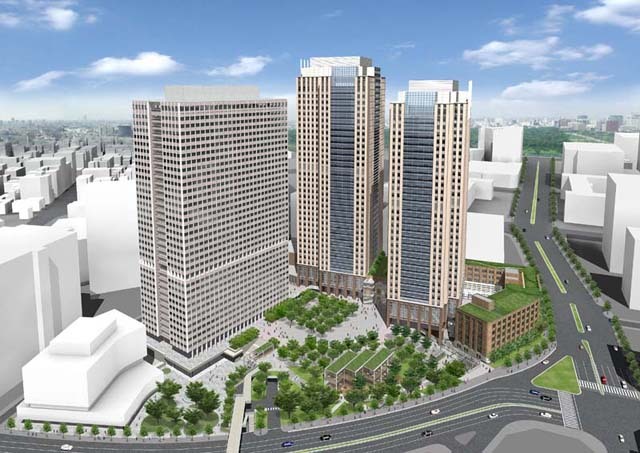 Part of the building of the Ministry of Education, Culture, Sports, Science and Technology will be retained and used, while the entrance doors of the Board of Audit of Japan and various monuments will be moved to the new building and used. Central Government Building No.7 is expected to be completed in fiscal year 2007.